What’s a diet got to do with my farm? I used to worry about whether farming is fattening. I even wrote about it in my post “Is Farming as Fattening as Birdwatching”. Well, now I’ve found a solution! The Fast Diet. It’s a diet where you not only lose weight, but you also improve your blood chemistry and lower your risk for disease like diabetes, cancer, and heart disease! You fast for two days in a week. During the fast days you only eat one or two meals that total 500 calories. During the rest of the week, you can eat whatever you want. What could be simpler than not eating? I’ve always thought that one day in the future, I’d eat more simply. More veggies, more beans, less processed food, less elaborate meals. I thought, perhaps when the kids are out of the house. But even after they left the house, I couldn’t change the way I ate. If anything, I even ate less healthily. I think The Fast Diet is something that will fit in perfectly with my desire to live more simply and eat more simply. And it makes me more excited about growing my own veggies, since I eat mostly veggies during the fast days. Now, here’s a summary of the book The FastDiet by Dr. Michael Mosley and Mimi Spencer. Over time our eating habits have changed. In the early days, humans would go for long periods without food. At one point, it was normal to avoid snacking in between meals. Now it’s become normal and even considered healthy to eat several small meals a day. However, most people eating this way end up eating more calories in total instead of less calories. People today tend to eat out of habit or boredom or just because they enjoy the experience. Hormesis is a well-accepted biological explanation of how “that which does not kill us makes us stronger.” An example is when you exercise you cause small rips and tears in your muscles and your body responds by doing repairs, making the muscle stronger. Moderate fasting stresses the body, but makes it grow stronger. 4-Day Fast – recommended every few months by Dr. Valter Longo of University of Southern California Longetivity Institute. However the author found it too difficult to do regularly. Alternate Day Fasting (ADF) – recommended by Dr. Krista Varady of the University of Illinois at Chicago. Also called alternate day modified fasting (ADMF). The author found it difficult to sustain over a long period of time because it was hard to plan for future events like dinners out with friends. Intermittent Fasting – this is the one recommended by the author because it is easier to sustain and he still got the same benefits of the 4-Day Fast and ADF. Repair genes – fasting makes your genes go into “repair mode” . When there is a lot of food, the body is in “growth mode”. It wants to continually grow and reproduce. It will only go into repair mode if it thinks you are in a famine situation. Autophagy – fasting switches on “a process called autophagy .. meaning ‘self-eat’ .. a process by which the body breaks down and recycles old and tired cells”. IGF-1 – This stands for insulin-like growth factor 1. Fasting reduces the amounts of IGF-1 in the body. “You need adequate levels of IGF-1 and other growth factors when you are young and growing, but high levels later in life appear to lead to accelerated aging and cancer.” He also mentions an interesting study on people with Laron syndrome who have very low levels of IGF-1. They are very short and don’t develop diabetes or cancer. Insulin and pancreas – there is a study that shows that intermittent fasting will make your body require less insulin to regulate blood glucose levels. This could mean that if your blood sugar was high, intermittent fasting will make it go to normal range. Cancer – studies are being done to see whether it is better to fast when undergoing chemo because the fasting will make the normal cells go into hibernation or repair mode. Things to measure – The author measured the ff points before and after going on the FastDiet for 3 months and found improvements across the board. His results showed he was either in the normal range or better than the normal range. He tested the ff items: body fat, BMI, waist-to-height ratio, standard blood test, fasting glucose, cholesterol, trigylcerides, and IGF-1. He explains how to read the test results. The author fasts on Mondays and Thursdays. The author eats at 7:30 am and 7:30pm. The c0-author has a snack at lunchtime. Others do late breakfast at 11am and dinner at 7pm. Two principles: high protein and low glycemic index. Otherwise you will feel too hungry. Think of the principles as “weapons to keep hunger at bay”. Don’t go on a permanent high-protein diet because its associated with increased risk of heart disease, cancer and chronic inflammation of IGF-1. Stick to USDA guideline of 50 grams (1 3/4 oz) of protein a day. And go for “good protein” that is low-fat. A good time is when you are busy but not on vacation and feel “strong, purposeful, calm and committed”. Tell friends you are fasting, you are more likely to stick to it. Don’t worry, hunger doesn’t grow and grow as the day goes on. It passes. You can expect to lose 1 pound every fast day or 10 pounds in 10 weeks. Be flexible. The nice thing about this diet is you can tweak it to suit your own preferences and still be following the basic method. If you don’t want to lose any more weight, you can switch to fasting only 1 day a week. The author answers some frequently asked questions. I’ll only include the more interesting ones here. Don’t drink alcohol on fast days. Drink as much coffee or tea as you want. No need to take supplements. Don’t fast if you’re below 18 years old, extremely thin, trying to get pregnant, type 1 diabetic, or have an eating disorder. The rest of the book is made up of cooking tips, menu plans with some recipes and photos, and a calorie counter. Typical 500 cal/day menus have more calories for breakfast than dinner. Around 125-178 for breakfast. A few days have equal calories for breakfast and dinner. 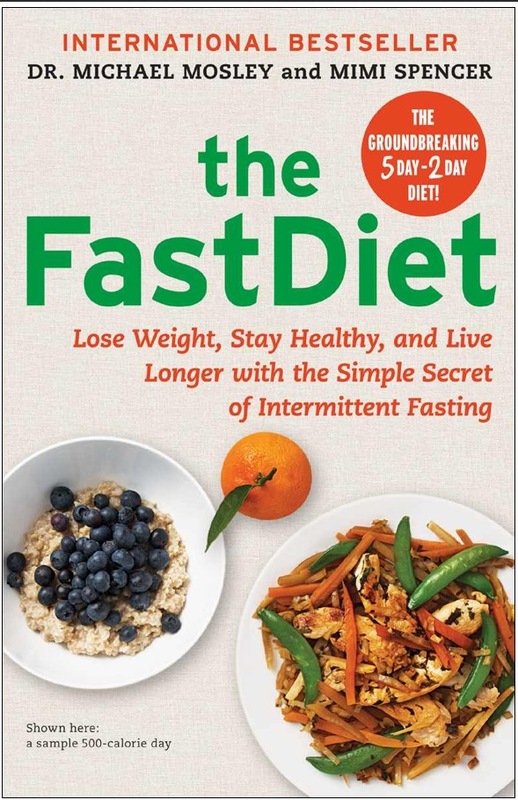 <– after this documentary aired in the UK, there was a clamor for more info on how to do the FastDiet, and the result was the FastDiet book! Watch the documentary! And let me know if you try the Fast Diet and how it works out for you! On counting calories, the book recommends that you download a calorie counter app like myfitnesspal or visit a website like Self Nutrition Data. What does 2pm to 2pm mean though? That would be your 24 hour period of fasting? So you could eat normally before and after? Thanks for the summary! I’m number 18 on the library waitlist for the Kindle. Glad you did a summary and I didn’t have to wait! You’re welcome! The book has nice menus with pictures and recipes. The calorie counter and explanation of glycemic index and glycemic load is also very good. Hi Sylvia, how long have you been on it? I want to try it based only on your summary, and get the book later for the recipes once I know I can do it. Hi Ipat, we started on April 22. Today is our 7th fast day. So far Tonji has lost 9 or 10 pounds! I’ve lost a few pounds and my stomach is smaller. I’m terrible at following diets, but I find this one easy because it’s only twice a week! There’s also an official FastDiet cookbook. I don’t have it though. So far we’ve only cooked things like boiled eggs for our fast days. Hi Sylvia! I’m a lazy reader but I finished your summary. Thank you so much and I’m taking on the challenge. Glad to hear that Ben! I wrote this summary so people wouldn’t have an excuse for not trying the diet! Wish you well. It really is the easiest diet ever. Glad to have found your site. I have just visited our property ( mountainous, left unattended for so many years thus resulting to deforestation) in Batangas . Our property is 350 meters above sea level, it has a view of the town and the sea but a lot of capital and work should be done to bring back life into it. Hi Tess, thank you for visiting my site and leaving comments! I hope you are able to improve your property. Just last month, someone from Lucban contacted me through my bird photography site. At first he was asking about birds, but later he also shared that he has a 20 hectare property for reforestation also! So interesting to find out that others have the same idea! His area sounds nice, he has waterfalls within the property and is near a good forest. I have been doing this for years ( not religiously) . When i climb the mountain for the first time , i accidentally fasted and lasted without eating anything. I try to fast every Monday! It’s not as hard anymore as it was in the beginning.